The MOBI format is used by Mobipocket eBook files. This format is supported by tablets, PDAs and most smartphone devices. The Amazon Kindle eBook reader also supports this format. The PDF file format is more popular among users and widely recognised. PDF files can also be digitally signed and locked for editing, and are viewable and printable in almost all platforms. 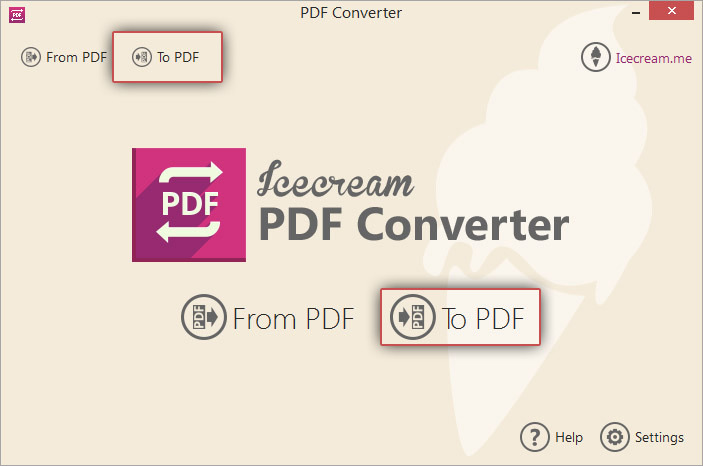 Download Icecream PDF Converter, run the downloaded installer file and follow the step by step instructions given in the setup wizard. Confirmation message will appear once the setup is complete and the application is ready for use. After that open the program to start working with your MOBI files. On launching the application, two options will appear in its home screen. 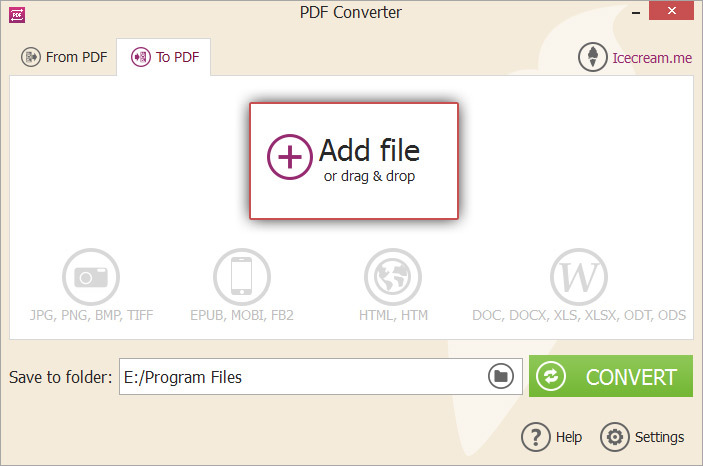 Select the “To PDF” option and proceed to add the files that you wish to convert MOBI to PDF format. 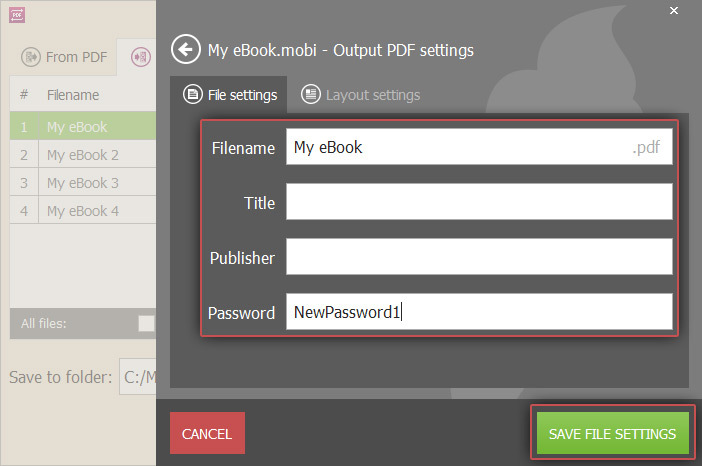 You can either use the “Add File” button to add MOBI files from your PC or directly drag and drop them to this window. All the MOBI files will appear in the list view. You can always add more files using the PLUS (+) button. Use the delete icon beside the file to remove it or the “CLEAR ALL” button/delete icon to remove all the selected files. 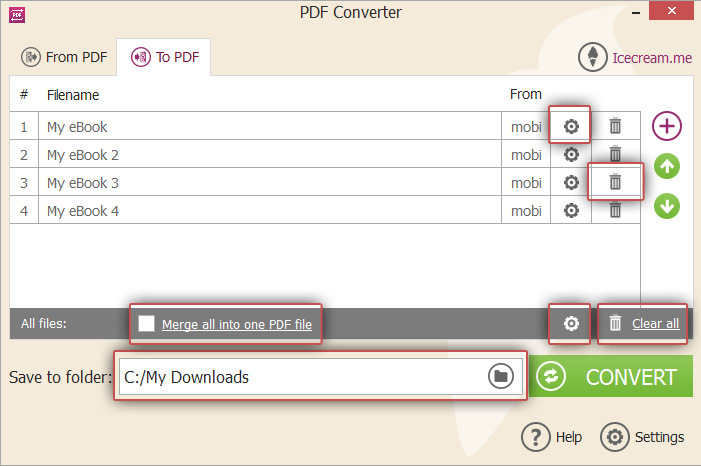 Select the “Merge all into one PDF file” option if you want to combine the contents of all the selected MOBI files to a single PDF. The files positions can be reordered using the UP and DOWN arrows in the right or by means of drag and drop mechanism. The generated PDF file will contain the content from MOBI files in the same sequence as the files are placed in the list. You can configure additional conversion options using the settings icon next to a file. A settings panel will appear where you can enter the following details: filename for the output PDF file, title in the PDF document, publisher information and password for accessing the file. Select “SAVE FILE SETTINGS” to save the settings and “CLOSE” to go back to main window. You can also specify common settings for all the files using the settings icon in the bottom of the window. You can select a destination folder by clicking on the folder icon from “Save to Folder” field in the bottom of the program's window. A folder selection dialog will appear allowing you to select the desired folder. All the generated PDF files will be saved here. Make sure you have selected the desired MOBI files and tweaked the right settings. Press the “CONVERT” button to start converting the MOBI files. A progress bar will indicate the current status of the conversion process. It will also display additional information like the elapsed time, the file being converted etc. After all the files have been successfully converted from MOBI to PDF format, a confirmation message will appear. Click on the button in the message to open the destination folder and view the newly created PDF files.